A recent bride stepped into her wedding day in style! 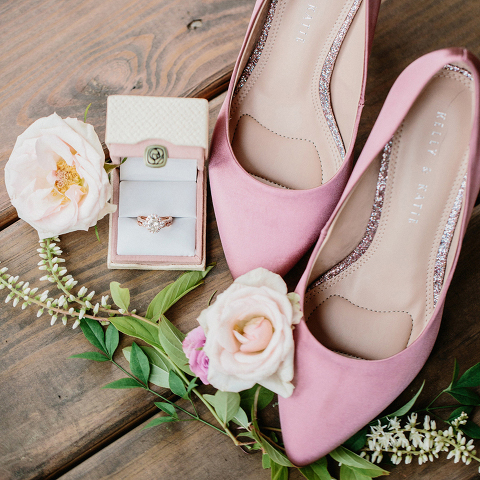 Shoes likely aren’t the first piece you think of when planning your day and they’re not often seen, but this bride carried her pink theme through with her florals, rose gold ring, and all the way down to her tiptoes! Her pink satin heels were even lined with sparkles inside for an extra touch of glamour! While she might not pass these down to the next generation, she certainly made memories of a lifetime dancing the night away with these pops of color leading every step! It’s just one of the many small details that showcases the care and thoughtfulness that can go into planning your wedding. Our countryside barn and open fields are peacefully set in the heart of Northern Virginia wine country.